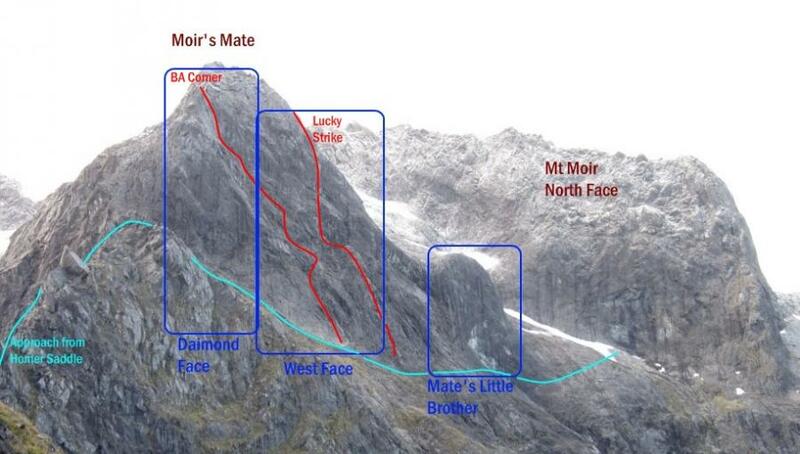 The routes on Moir’s Mate are accessible as day climbs from Homer Hut. Take the track to Homer Saddle from the tunnel, then follow the ridge to Moir for about 45 minutes to an hour. From the summit of Moir’s Mate scramble down ledges on the north side until stopped by steep ground where the slabs join the Homer Ridge. Two or three abseils to the scree slopes below the west face of Moir’s Mate depending on the amount of down climbing you wish to do. Careful with rope jam on the initial abseil.